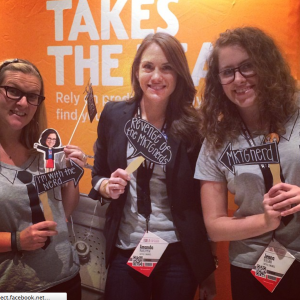 #MPB2B Recap: What’s Next in B2B Marketing? the event was centered on looking forward for 2015, which was spot on as many B2B marketers are starting to hunker down and plan for the coming year. As always, there was an amazing selection of sessions for marketing nerds to attend with some of the best speakers in the industry. Here were my highlights from the event, in case you missed in. In the Present and Future of Marketing Automation panel, Scott Brinker of ion interactive led a discussion with Jon Miller of Marketo, John Stetic of Oracle, You Mon Tsang of Outmarket and Atri Chatterji of Act-on about the opportunities, trends and challenges ahead. In Follow the Fear: Improv Rules for Telling Your Story, funnyman Tim Washer shared his experiences studying improv with the likes of Amy Poehler – heard of her? – and how marketers can adopt the key rules of improv to create and innovate. Mistakes are Gifts: One of the first things you learn in improv, is that there are no mistakes. If something goes differently than you planned, take that opportunity and do something with it! It’s all about learning from your mistakes and figuring out what to do next, rather than thinking of them as failures.Take Care of Your Partner: In improv, it’s all about making your partner look good and setting him or her up for success. One related rule is to never say no. In a business setting, we can think of how we can make others’ jobs easier, whether it is our sales or product counterparts.Follow the Fear: The final rule Tim shared is all about getting outside of your comfort zone and chasing the things that scare you. Instead of second guessing and judging, test out your ideas and just go with something new. Tim shared an excellent example of Cisco marketing its $250K router as a Valentine’s gift – leading to a wildly successful campaign. In Transforming Marketing to Drive Innovation, Carlos Hidalgo from Annuitas Group presented about how important it is for marketing to change. Despite everything we are doing, B2B marketing as a whole is in trouble. In an Annuitas study, 2.8 percent of marketers reported that they were effective at demand gen. Carlos asked the question, “We’re doing a lot of different things, but are we doing things differently?”We’ve heard time and time again that the buying process has changed and such a large portion of it occurs online without the vendor having any insight at all. So why are we will spamming lists with drip campaigns rather than getting to really know our buyers?A staggering 70 percent of marketers receive no training and are self-taught marketers. We need to move forward, identify and develop the skills we need to become more effective marketers. If not, get a new job.